Don’t know exactly what it was about this particular cover, but I always found it to be a bit off-putting. I mean it’s a beautiful Infantino/Anderson art job which would normally have me in love with it right out of the gate, but somehow it just never clicked. I’m going to say that it was that weird purple sky. Remind me to never put that much purple on a comic book cover. And, of course, just to double down on things, DC accidentally sent me two copies of the book. Thanks, guys… you couldn’t have sent me two copies of Flash #123 could ya? 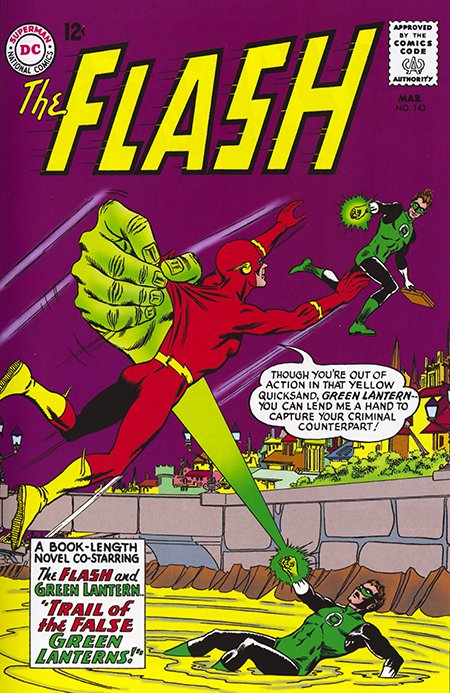 This marks the third team-up between between Green Lantern (God I love that name) and The Flash if you don’t count their Justice League appearances, and, as with the previous one, there is no crossover between the the two books. Crossovers, as I’ve said before, were always maddening in those pre-comic shop days. Although these days my comic shop sommelier keeps forgetting to grab books for me that are on my pull list, so, in many ways, not much has changed. The story starts when four Hal Jordans turn up in a line-up at Barry’s police precinct and we’re off and running. Barry is able to deduce who the real Hal is and as the Flash and Green Lantern they take off to charge GL’s ring and then figure out who the other Hal Jordan’s are. Which is pretty easy because when they get to GL’s power battery, three other Green Lanterns show up and in three pages of expository dialog and pictures, we get the whole back story. Turns out a guy named Thomas Oscar Morrow (Tom Morrow, get it?) has been peeking into the future which a machine he made to find ways to make himself rich. Among the things he swipes from a future time is a duplicator ray which strikes Hal while on a test flight at the edge of space and makes three duplicates of him. If I may be allowed a brief aside, when the ray strikes his plane, Hal thinks he’s observing the Glenn Effect which were luminous particles that John Glenn observed when he first orbited the Earth. I used to love these little science touches that writer John Broom threw in. It’s possible that it made us readers feel just a little bit superior to our non comics friends, but I doubt that any comic book fan would commit that sort of venial sin. Meanwhile, the three Lanterns announce that they plan to commit some big crimes around the world, stealing the Mona Lisa, the Statue of Liberty et al and also that their power rings have been souped up a bit. This last bit is important because it’s what allows the Flash to spot the fake Green Lantern when his yellow boots can walk on a bridge made by the Lantern’s ring, which, being an improved ring meant that it was as impervious to the color yellow as anything else. In thus manner the day was saved. In an unusual ending for the villain of the piece, the evil scientist Tom Morrow falls into some powerful electrical coils and dies. Given that villains were usually brought back at some future date, and, also given the power of the Comics Code Authority, this this sort of ending was definitely not the standard fare. So it certainly set a different tone for this book.